Home Ask Leena Air-born Viruses, Colds, Or Weak Immune System? You feel like you are dying. Nose stuffed up and running, running, running…or maybe you have lung congestion and a horrible cough. The local fires are not helping. So much green mucus is flowing, you feel like Linda Blair. Friends told you about the wondrous benefits of “neti”–or salt water irrigation–for clearing the sinuses and health maintenance/disease prevention made popular by Oprah. But it sounds icky and “New Age”. After three days and the third cold in as many months, desperation set in. You dragged yourself to the local drug store or health food market and got one of those weird-looking pots. Even selecting one was an exhausting process. There were so many different kinds that you almost left without one. But you persisted. After a cursory read of the instructions, you dived in. You dumped the salt in the pot, filled it up, stuck the nozzle in your nose and YIKES! Pain, clogging, panic! Nothing came out. Great. Now you had increased the pressure on those clogged sinuses AND a headache and you’re out fifteen bucks. You swore you would never do that again; hiding the pot in the dark deep recesses of the bathroom cabinet, tossing down a generous dose of Nyquil and burying yourself underneath the covers until the shot of green liquid temporarily knocked you out of misery. But you’re still sick and weak with additional depression because there is no solution in sight. 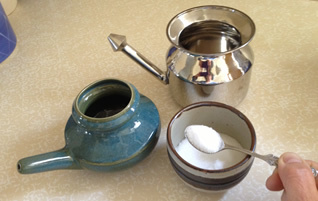 Learn the truth: The Neti Pot and the practice of jala neti (water cleansing) is not New Age, it is Old Age. Salt water irrigation of nostrils is an ancient Classical Hatha yoga practice as yoga as a Downward Dog. (Google the shat karmas or Six Actions) Today, we know that these practices have scientifically proven benefits. Jala neti is a preventive practice like brushing teeth or taking a shower. Practice jala neti as a daily or frequent health habit to keep nasal passages and sinuses clear so they don’t trap forest fire ash and particulate, viruses, bacteria, chemicals, dust, dirt or debris; not just as a remedy or quick fix once you are ill. Avoid creating a growing medium like a Petri dish for disease and infection to flourish thereby reducing constant strain on the immune system from airborne toxins. Flu viruses are all airborne. Once one is ill, quality of life suffers. It is a lot of work to get healthy. Check with your health professional for contra-indications. Rarely, one may have an inner ear issue that makes jala neti prohibitive. Most problems with the practice are from user error. Test the water temperature. Use luke-warm water—not to hot, not too cold. The extremes are very uncomfortable. Don’t use water quality as an excuse not to do jala neti. If you are concerned about the water you drink or use for showering or brushing your teeth, or washing your face then use distilled water or get a good water filtration system. If you have a fear of organisms in water traveling to your brain, then certainly don’t go underwater in a swimming pool, Jacuzzi or bathtub or get water in your ears. Salt is a purifier. Use only SEA SALT, not iodized salt. It does not have to be expensive. Sprouts and Whole Foods markets usually carry bulk sea salt for less than 60₵ a pound. Test the saline content: Fill the pot with water. Add some salt and stir to completely dissolve it. Taste a drop. It should taste like tears. If the water is extremely salty or not salty enough, it will be uncomfortable though not really harmful. Some like a little more or a little less salt. You will discover the range of salinity that feels best for you. Gently, test which nostril is more open—easier to breathe. Pour water through that side, first. Make sure there is a good seal between the nozzle of the neti pot and the nostril. Bend at the waist and tilt the head to one side. Make sure that the nostrils are below the bottom ear to prevent water from being lodged in the ear and possibly causing infection. After running water through one nostril and out the other, blow the nose a couple times with gentle, staccato exhalations. Gentle is the operative word. Repeat on the other side. Repeat gentle blows. Rinse the pot and dry it thoroughly after each use to avoid bacteria, mold, etc. Just like you do with your dishes. First-timers: Don’t be surprised if you feel a little head-achy or have post-nasal drip for a little while after the procedure, perhaps for the first few days. A lot of stuff has been impacted up in there for a long time. After a few days, you should notice that you feel clearer; refreshed, awake and energized. The flow of water stimulates and massages the nerves of the five senses which converge at the bridge of the nose between the brows; an additional benefit. You are receiving more air and prana or chi (life-force energy) to the lungs and throughout the body. For more information or how to choose the right neti pot for you, contact me via: http://leenastmichael.com/contact.htm. I am also available for private 30-minute training sessions. I offer free sessions to all of my current Rossmoor and Town of Danville yoga students by appointment before or after class. breathwork, Hatha Yoga, health, natural health, Neti Pot, salt water irrigation, wellness, yoga, yoga/meditation.